Tim Davies announces the first ever DeBreved Orchestration Insensitive (workshop/master class/clinic/corroboree). 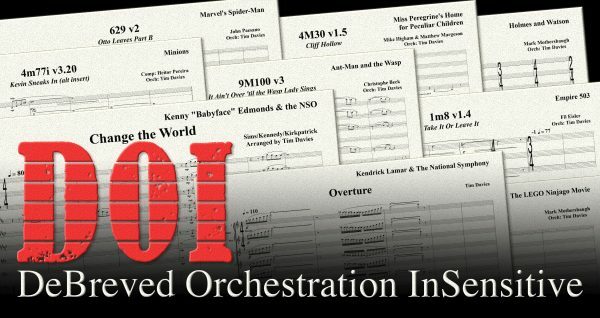 Four people will be selected to spend a day with Tim, talking about orchestration, technology, and workflows with a focus on what it is like to orchestrate studio film scores in 2018. The Insensitive (workshop/master class/clinic/seminar/corroboree) attendees will be expected to already possess a working knowledge of the orchestra, and to have skills on notation programs and DAWs. Professional experience in the film world is not required as the workshop will be focused on developing and transferring traditional skills for use in the film world. Four participants will be selected based on the strength of their score, and these applicants will be sent a cue to orchestrate from one of Tim’s recent projects. The orchestration will then be studied on the day of the workshop. If you won’t be able to spend at least a day orchestrating a cue between 10/18 and 10/25, this opportunity is not for you at this time! You have questions? Tim has answers. I have given lectures and guest talks, but in an hour or two we can never get into much detail. With a day we can really get into some proper discussions and I can pass on some of the knowledge I have acquired in my career as an orchestrator and conductor in Los Angeles. Plus everyone else seems to be doing a workshop/masterclass/clinic/seminar/intensive. And I have been told I can be quite insensitive at times. There are probably only four people who would put up with a whole day of me, it would be embarrassing to say eight and only have four apply. Also, the Insensitive workshop will happen at my place, where four is a perfect number to allow everyone to interact together and fully participate. No, keeping the size small is important as it allows me to be extra insensitive. I will try not to make anyone cry, but this is not going to be all warm and fuzzy, pay the money to be told how good you are. Go to college if that is what you want. The entries are due really soon, I don’t have time to write something? If you don’t already have an orchestral score ready to send, you might not be ready for this round. Anyone can enter, but you must have the time to do the assigned cue and be in West Hollywood on October 25. How big does the orchestra have to be for my submission? Big enough to demonstrate you know what you are doing. How long does the entry submission score have to be? Long enough to demonstrate you know what you are doing. How will this compare to other workshops and courses? Nothing! If I charged what it is worth, no one could afford it, so why bother? But I won’t say no if you all chip in for my lunch. I am trying this out. If it goes well then when time permits I will do it again. Maybe with a different focus, perhaps studio conducting, or arranging. The importance of good coffee and the correct way to prepare and eat vegemite. Maybe something about film orchestration. I did not get selected, why not? It could mean that more than four people applied, the dog ate your score, or any number of other tragedies occurred. “Thanks for all your amazing submissions. The standard was so high I had a really hard time narrowing it down to the successful applicants. If you did not make it this time, please try again next time.